What do you look for when you take your children to see Santa? 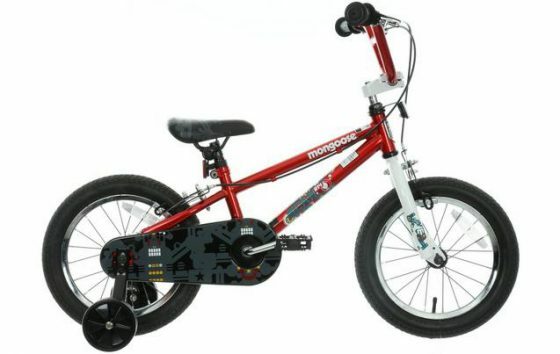 With the myriad of opportunities available these days, I like to think it’s getting easier to find one that speaks to all your child’s needs, whatever they are. For us, it’s important that there’s no pointless hanging around and even less that there’s any queuing. Oscar’s Autism isn’t massively sensorially based, but he does need to be able to move as much as possible and queuing just makes no sense to him (I often wonder if he’s really British at all 😉 Joke! ), to the point it can make him anxious. He also struggles to concentrate for long periods of time on one thing, preferring lots of small activities to one big one. So when we were invited to come and meet Santa at Marwell Zoo the description they gave to us ticked lots of our boxes straight off. No queuing, no pointless hanging around and plenty of activity. It sounded too good an opportunity to pass up. 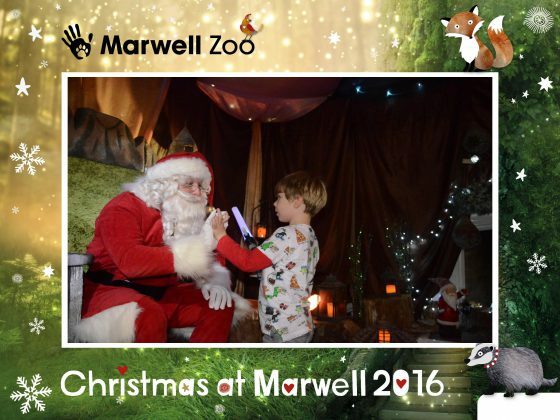 Meeting Santa at Marwell Zoo is a real event. 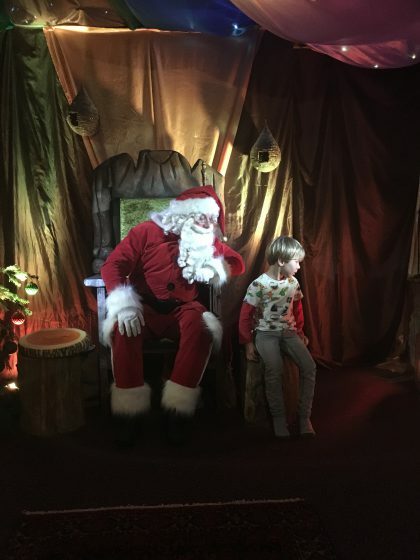 We’re not talking just chatting to a big man in a red suit and white beard, it’s a whole experience. We were well prepped as to what to expect and couldn’t have had a better time. We arrived at the zoo before our allotted time, which gave us time to go round beforehand. 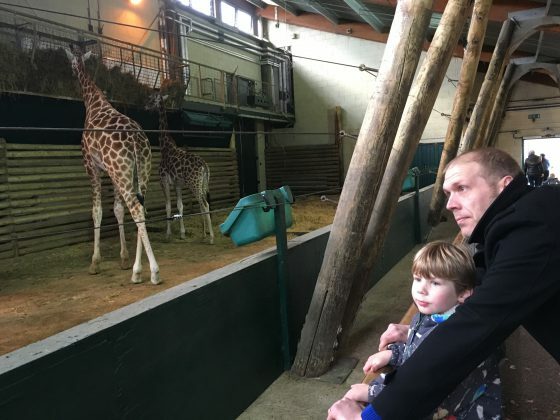 I think Oscar would have been heartbroken if we’d gone all the way to the zoo and not seen the animals, Santa or no Santa, so we were really grateful that our ticket included entrance to the zoo. However, it doesn’t have to be, if you’d rather just visit for the Christmas experience. Join the elves in Magical Marwell Hall and warm yourself with a glass of mulled wine or blackcurrant and a festive treat. 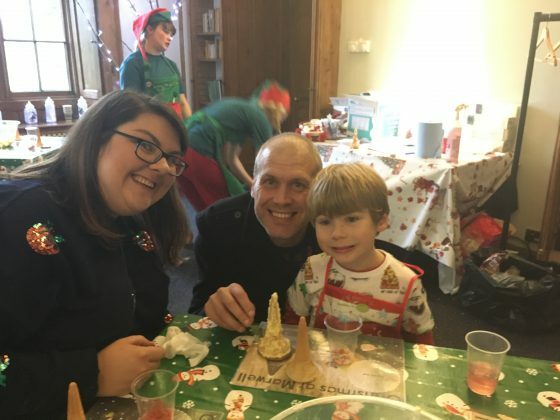 We were welcomed to the perfectly beautiful Marwell Hall, by a team of elves, all dressed to the nines and all who seemed to have been thoroughly briefed on Oscar’s Autism and his needs, which was a wonderfully thoughtful touch. 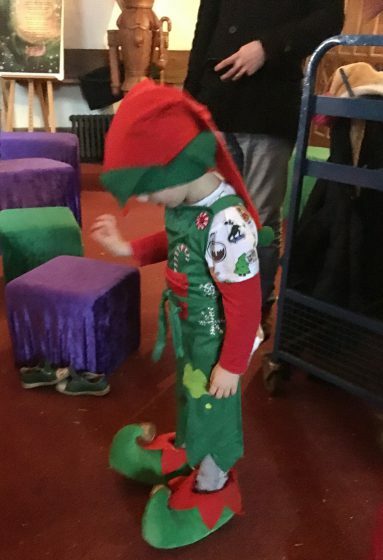 We got our drinks and Oscar had a mince pie before taking a real shine to one of the elves’ outfits. Mistletoe really earned her Nice badge that day by removing her shoes, apron and hat and letting Oscar try them on. Baring in mind this is the boy that doesn’t really do dressing up, he had a whale of a time! He was so happy, it bought a tear to my eye and we hadn’t even seen Santa yet! 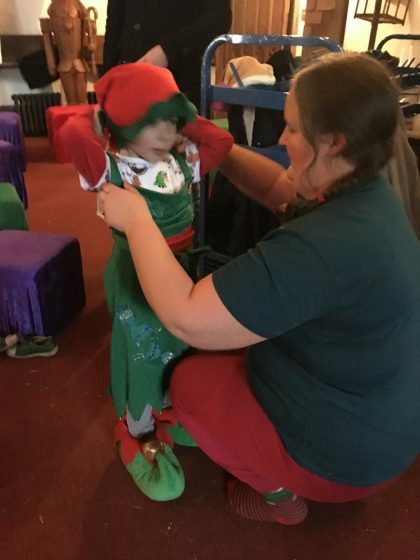 Oscar takes a shine to Mistletoe the Elf’s uniform. So she gives it to him to wear! To amuse the children while we waited for everyone to arrive there was a touch screen Naughty and Nice list for the children to check, which I though was a really clever touch, especially as the children could find their own names on the Nice list and their favourite super villain on the Naughty list! I had explained to the staff beforehand, that Oscar was unlikely to sit and listen to a story. They couldn’t have been more understanding and suggested that we skip that part of the experience if we wanted to. However, on the day we decided to give it a go. The staff were prepared for him to leave at any point, which was very reassuring. 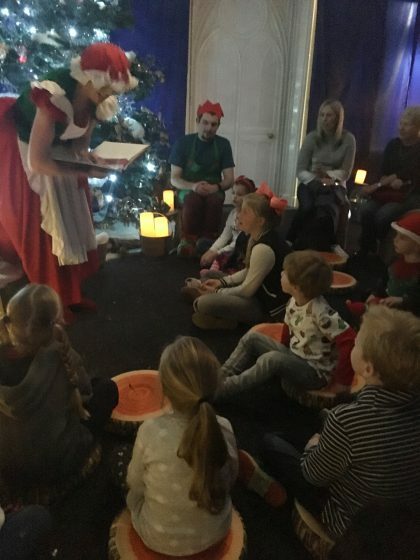 Mrs Claus was waiting for us in a gorgeous ‘woodland grotto’ complete with trees, snow, toadstools and tree stump cushions. She proceeded to read a beautiful Christmas story, set at the zoo and based around the animals, which was a clever touch. And blow me if Oscar didn’t sit with the other children and listen to part of the story. 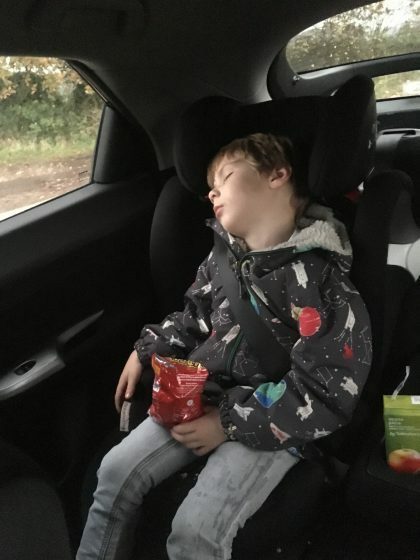 OK, he didn’t make it the whole way through, but by allowing him to move around as and when he needed he lasted for at least 3/4 of the story. It blew my mind! You’re not seeing things. That’s Oscar, right in the middle. Sat on a carpet. with other children. Listening to a story. Regardless of how long it lasted, it happened and I couldn’t have been more proud. The fact that Mrs Claus was wonderful and read such a lovely story may have helped! If Oscar had surprised me in the previous two sections, how he reacted in the craft based activity amazed me. We were lead into yet another beautifully decorated room, laid out with everything needed to make ice cream cone Christmas Trees. I expected him to just choff the sweets and ignore the craft, but I need to stop underestimating my boy. He sat and happily made a beautiful tree. As did mummy! The elves then wrapped them in cellophane and ribbons and when we were ready lead us to the main event! 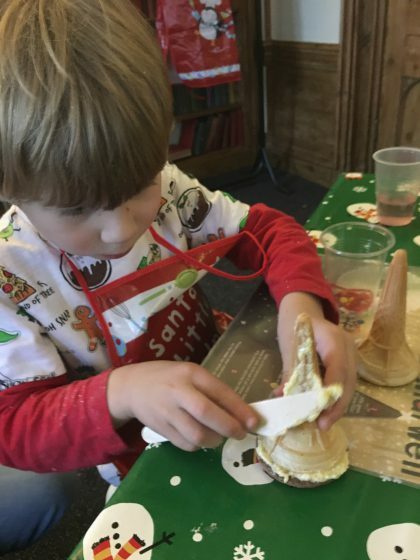 Every family was assigned a table to make Cone Christmas Trees. Such concentration! Family Savage. A rare photo indeed! 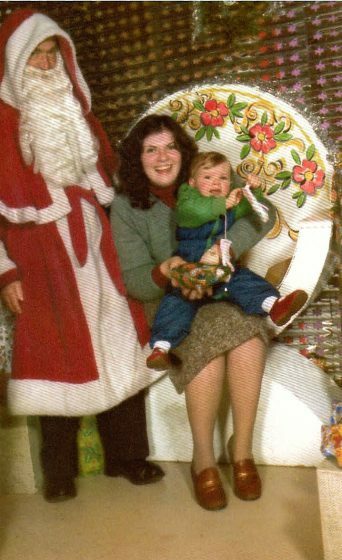 We had agreed with the park beforehand that Oscar would be the first child to go and see Santa, to avoid any prolonged waiting and they were as good as their word. The whole team knew Oscar was to go first and again their communication was much appreciated. 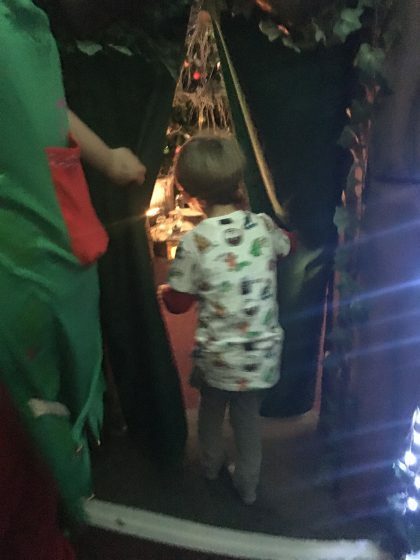 We were lead into another room, where Oscar was shown a curtain to pull back to reveal Santa’s grotto. It really was magical! After a quick peek he ran into the room and whilst he didn’t seem blown away by the fact that the big FC was sat there on a throne, he did go and chat with him, after having a look around the room. 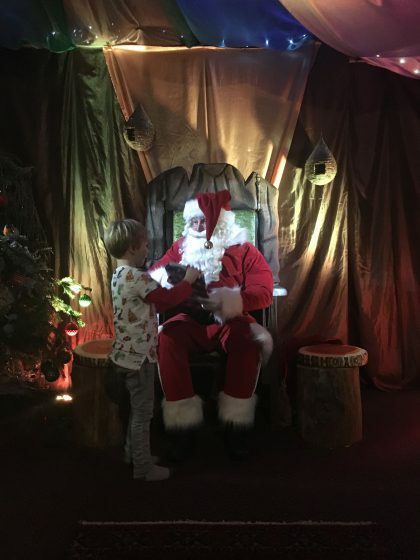 I really feel the ‘Santa’ can make or break an experience like this and Marwell’s Santa was fab. He spoke to Oscar like you would expect, but I got the feeling he’d also been briefed on Oscar’s needs as he didn’t seem phased by Oscar’s apparent lack of interest. He didn’t ask for a hug or for Oscar to sit with him (although at one point Oscar chose to go and sit next to him) and he didn’t seem upset when Oscar’s most pressing question was “Where’s the presents?”. Love him. 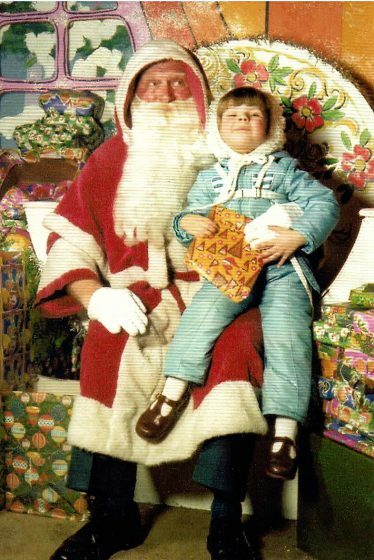 He didn’t mean “wheres my present?” (well not completely), it’s just you very rarely see Santa without presents in books and films do you? And he’s a literal thinker my boy. Santa happily handed over a gift, which we let Oscar open immediately. And when Santa asked for high five, Oscar happily obliged. It was fantastic! Oscar chose to go and sit with Santa. Even if he didn’t want to look at him! The only thing I wished I’d done differently was taken the boy camera. Much of the experience was dimly lit and my iPhone photos just don’t do the day justice. 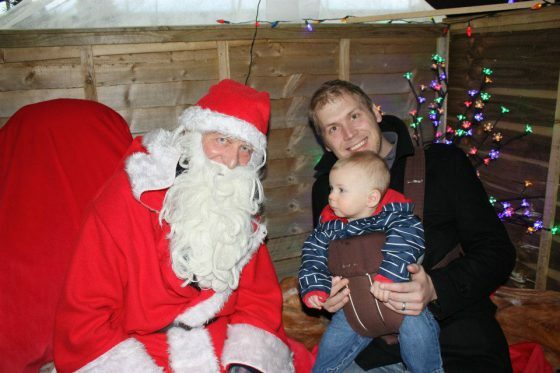 We did however purchase two of the official photos of Oscar meeting Santa, which I thought were great value. Both were printed and framed in a carboard sleeve as you would expected, but we were also given hi res digital copies. All for £10. My boy is too cool for school. Who wants to hug Santa when you can High Five! Would I go back? Totally. If the staff were as understanding and well briefed as this time, I’d be there in a shot. Oscar loves Marwell and has done for years. Who wouldn’t want their child to meet a real childhood icon in their favourite place in the world? 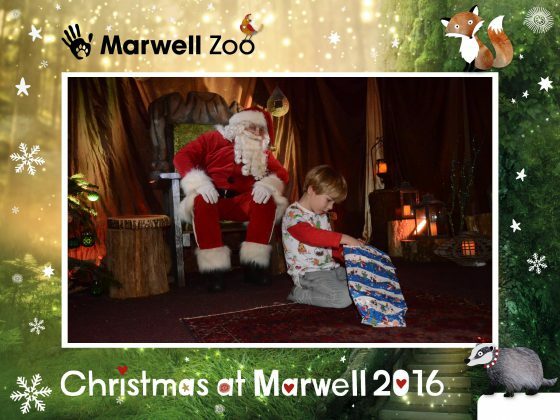 Thank you so much to Marwell for the invitation to meet Santa. It’s true. It’s 18th December and I haven’t written a single Christmassy post this year. Compare that to last year, when I couldn’t get enough. Ahh well. It’s not that I’m not feeling the festive spirit, I am, just in a different way and with so much else going on, it’s felt disingenuous to write light hearted pieces when I don’t really feel light of heart. But preschool term is now over. The paperwork for his EHCP is being processed and we wont find out until the beginning of January as to whether he gets one. Schools are closed and I can’t visit any more. So I’ve decided to try and put all that down for the holidays. Worrying and even thinking about it wont change anything. It’s time to lay those weights down for a few weeks and just enjoy my family. So what are our Christmas plans? Well, actually it’s the one thing that’s kept me going these past few months, I am so excited about it. Last year we stayed home and went out for Christmas dinner (as we’ve done several times before). It wasn’t exactly a disaster, but the wait for the food was interminably long. Oscar coped (just), but it took everything we had in us to get him through and I realised, even then, that I would need more control over the situation this year. We don’t have the space to host Christmas at home, so it was clear we would need to go somewhere else. But asking family or friends to host and then asking them to do everything your child needs to make it through the season, well it was a big ask. Too big an ask in my eyes. So back in the summer we decided to hire somewhere, make a holiday of it. And if we were going to do that, then why not do it where all our family are. Which is how we came to find an apartment in the Royal William Yard in Plymouth, Devon. It’s a relatively newly refurbished Victorian military barracks and we’ve hired a three bedroom apartment for the entire Christmas week. I’m so excited. It not only gives me a place to cook and serve Christmas dinner to my family (something I’ve not done properly in five years! ), it also means my mum can stay with us on Christmas Eve and see Oscar opening his presents (something she’s never done), we can see all our family and friends over the course of a week (instead of trying to whiz round and see everyone in a couple of days which we usually do when we visit) and be included in traditional family shindigs. But the best thing about it is I can give Oscar the time and space to decompress, as and when he needs it. Staying with other people can be a wonderful experience, but it puts an awful lot of pressure on everyone. And this way if my son just wants to watch Thomas in his pyjamas and not go out, or we need to leave somewhere he’s been over stimulated, we can. I’m not saying it’s the perfect solution to what can be a stressful time for everyone. I’ve been mentally planning what I might need to take with me to be able to cook a full Christmas dinner in a strange, and not necessarily well equipped, kitchen (this is after all a holiday let) for weeks. But I think it’s a damn near close as I can get it. And anyway, my sister in law text me the other day to tell that that although they’re away on Christmas day, she’s giving a key to Ben’s mum and should I need any utensils or such from her well equipped kitchen, then to just take them. I could have kissed her. Had she not been 300 miles away! But that’s exactly what I’m hoping this Christmas will be all about. Family. Oscar is a part of a family he barely knows and I want that to change. I want him to spend time playing with his cousins, who when he does see he adores. I want him to spend time getting to know his Aunties and Uncles (Uncle Paul, I hope you know we have a child as active as you ever were!). I want him to feel the love his grandparents have for him. Everyone has been so supportive of him and everything about him that makes him Oscar. To them he’s just one of the clan. Oscar’s ‘Christmas Book’, a book of pictures to help him identify where we’re going and who we’ll be seeing beforehand. So we’re off on 23rd. And I can’t wait. I’ve made a book of laminated pictures of the flat and all our family for Oscar to look at. The food shopping has been done online. The presents have all been bought and wrapped. We’ve got the artificial tree to take with us. The flat has wifi. What more could we need? As with everything we’re expecting the best and preparing for the worst. Oh, and Ben and I are taking full advantage of having my mum with us on Christmas Eve and leaving her to babysit while we go for dinner at The River Cottage. River Cottage Canteen Plymouth – our Christmas Eve plans!